Opportunity Partners was founded in 1953 as Opportunity Workshop and is celebrating 65 years of partnering with business and the community to help advance the quality of life for people with disabilities. The organization serves 2,000 adults with disabilities through training, employment and residential programs with a team of 600 staff members. It partners with area businesses by offering packaging and assembly services, contracted work teams or individual job placements of people with disabilities. 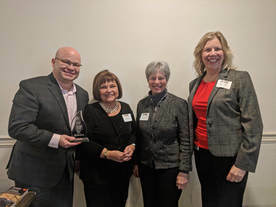 Over the years, the organization has served many individuals and businesses in the east Metro, and last year moved its Brain Injury program to a new office space off Pilot Knob in Mendota Heights. One St. Paul company Opportunity Partners currently works with is Cintas, which supplies corporate uniforms and other products. Up to 20 Opportunity Partners individuals work there each day, processing hangers from work uniforms. The Opportunity Partners team sorts, straightens and processes up to 40,000 hangers each day. Other business partnerships in this area include the Air National Guard and MnDOT, where Opportunity Partners provides cleaning and janitorial services.